Sri Lanka is boasting a world record with a soaring Christmas tree that the government says will build national unity, but the Roman Catholic Church in the island nation just off the southern coast of India says it is a waste of money. 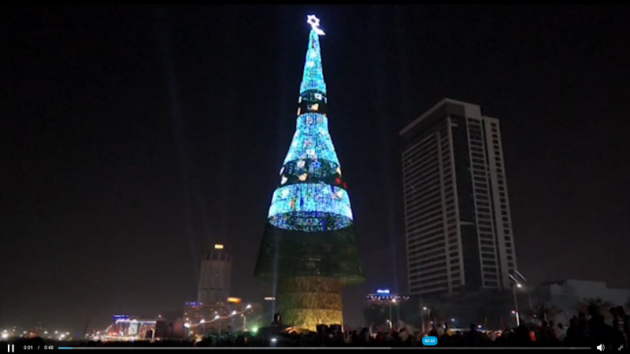 The artificial 73-meter (238-foot) tree is built in the capital, Colombo and the organizers say it is 8 metres taller than the current record holder, The Associated Press reports. The tree is supported by a steel-and-wire frame and is covered with a plastic net decorated with more than a million natural pine cones painted red, gold, green and silver along with 600,000 LED bulbs and a 6 meter (20 foot) star summit. The tree cost an estimated $80,000 to build. The Catholic Church in Sri Lanka, however, criticized the government for erecting the tree, calling it a "waste of money" that could have been used to help those in need this holiday season, according to local reports from Columbo. Building the tree needed the labor of hundreds of port workers and volunteers for four months but work on it was halted for six days earlier in December when Cardinal Malcolm Ranjith publicly denounced it. Prime Minister Ranil Wickremesinghe, however, restarted the project back on the assurance that it wasn't funded with taxpayer money, but by donations from individuals and private organizations. The main organizer of the Christmas tree's construction, Mangala Gunasekara, said it aimed to promote ethnic and religious harmony in a country that is 70 percent Buddhist, according to Sri Lankan census in 2011. "This is just to show the world that we can live as one country, one nation," said Arjuna Ranatunga, a former cricket player and the minister of ports and shipping. He said Sri Lanka still is still grappling with issues regarding religion, caste and race," AP reported. The south Asian nation spent decades of the 20th century in a bloody civil war involving mainly Hindu Tamils from the Tamil Tigers separatist movment. Sri Lanka's population of around 20.5 million has approximately 1.5 million Catholics.